Sutter isn’t interested in plans for the future; he lives for the constant pursuit of the spectacular now. He spends most of his last days of high school drunk and looking for a good time when he meets Aimee, a shy girl without much self-confidence, and decides to help her come out of her shell. He’s not looking for a girlfriend, but somehow that’s what he gets in Aimee. 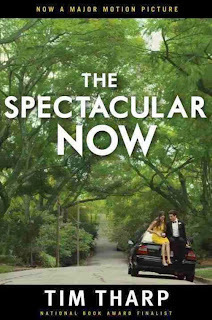 But as graduation draws closer, Sutter can’t help but wonder who is helping whom, and whether or not the spectacular now will be enough for their relationship. The Spectacular Now is an interesting study of Sutter’s character and his inner thoughts, beliefs, and motivations. Tharp mostly explores Sutter’s character and what makes him act and react, but outside of Sutter, the book is light on plot. Aimee’s blindness and naiveté make her hard to like as a character independent of Sutter, and Sutter is even more unlikable when it becomes apparent that he is taking advantage of Aimee’s adoration. Tharp’s writing is honed, sardonic, and interesting, but the conclusion of the story leaves the reader wondering if Sutter ever experienced any character growth, if he even believes in all of the encouragement he offers Aimee, or if Sutter’s purpose is just in breaking Aimee’s heart. Cover Comments: I hate the original cover, but I like the movie cover, hence this is the only time you will ever see me post that over the book cover. But, isn't it pretty? Isn't it promising? I admit that I have not seen the movie yet, although I would like to after hearing so many good things about it. I hadn't even realized this was a book until Sara Zarr posted a Facebook status about the book, and about the tragedy of the story. This is a really depressing and frustrating book, extraordinarily well-written. I think the move looks like it promises something a bit happier. I'll be interested to compare them.